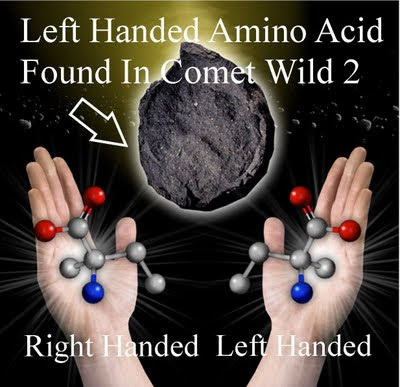 Left handed amino acid seems to be created inside comets like wild 2. 1: that we need a new black hole paradigm to solve this. 2: that the vacuum seems to have chiral abilities to be responsible for the creation of only left handed amino acids. 3: that we need a new standard model of elementary particles, which is able to form atomic anti-symmetry out of symmetric vacuum Higgs particles. 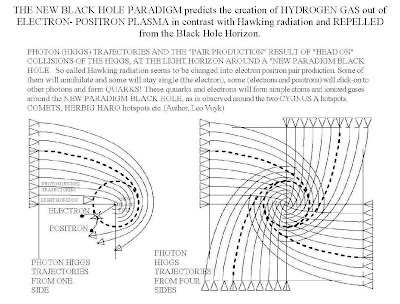 If the new black hole paradigm described on this blog, include micro black holes ( equipped with a small fermion repelling horizon) as the origin of comets, then hydrogen gas and more complex amino acids, may be produced together with water molecules around its hot micro black hole nucleus. The origin of life seems to be connected to Comets. The origin of Comets seems to be connected stellar flares. The so called missing mass problem of starforming regions could be solved. THE INTERNAL HEAT OF THE EARTH AND NEW PARADIGM BLACK HOLES. The internal HEAT source of the Earth should be found in the existence of internal new paradigm black holes being the remnants of Comet nuclei, crashing into the Earth in the past, just as we have experienced by the Schoemaker-Levy 9 Comet impact on Jupiter and Sungrazer Comets into the Sun. New paradigm black holes are supposed to have a small globular Fermion repelling horizon. Able to stay inside the earth without consuming it and responsible for electric currents and magnetism. 1, that the universe is interpreted as a fully symmetrical multiverse in raspberry form with a real particle based entangled quantum system, with digital alike features. 2, that the universal vacuum is interpreted as a linear energetic oscillating particle based "space frame" in the form of an incomplete 3-D tetra/octahedron lattice, with a fixed chirality left or right for individual (sub) universes and a lattice length of the Planck Length. That the energy of all these oscillations is the origin of so called "Dark Energy" which is compensated by the negative (Dark) energy of the vacuum oscillations within the distant anti-mirror entangled Universe. 3, That the vacuum is acting on objects (quarks and Leptons) in FREE FALL in the form of mutual compensating resistance and propulsion by the vacuum, originating real Lorentz Transformations , Local Time and Inertia. 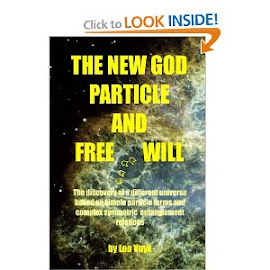 4, that the universe is created without "broken symmetry" by a 3-Dymensional semi-cold Fractal Big Bang out of a "Big Crunch Black Hole nucleus" with a finite particle content. That there is always a mirror symmetry between opposite parts (universes) of the (Raspberry shaped) globular shell of semi-cold Big Bang Fractal expansion down to the smallest sub-quantum scale. 5, that as a result, an even set of anti-COPY universes will exist, equipped with mutual so called "anti-mirror symmetry", which is present not only at the quantum level but on all levels of existence, up to humans. 6, that real Toroidal shaped unifying vacuum particles dubbed "Higgs-Virgin particles" can change shape, by mutual collision or collision with fermions into other singular particles, which are able to combine into compound quark particles like quarks or "massive" Leptons (Muon and Tau) . 8, that the oscillating vacuum particles are the only energy source in the universe, "pushing around" all real but "complex spinning" propeller shaped particles, (Fermions). 9, that Photons are "short living" (<1 cm trajectory) single shaped particles, originated by each collision of a vacuum particle with Quarks or Leptons. After <1cm, the photon pops back as a vacuum particle, initiating a photonic information wave. Within the 1 cm boundary the photon is supposed to be able to compute and file its digital direction in the vacuum lattice, its local lightspeed based on different micro amplitudes inside the Vacuum Lattice and its polarization plane. 10, that all inertial motion of matter in the local vacuum frame is maintained on what is coined real "Lorentz polarization" of propeller shaped Quarks or Leptons. Quarks and Leptons are supposed to be rigid particles propelled by the oscillating vacuum itself. The Lorentz polarization is supposed to guide the propeller particles main axis, to overcome the vacuum frame resistance. That the local oscillating vacuum frame and the absolute speed of matter through the vacuum frame, is responsible for the jitter of Quarks or Leptons, which is responsible for local Time and Mass (real Lorentz transformations) . 11. that black hole nuclei tend to explode if they are not stabilized by enough vacuum pressure, originated by the vacuum oscillations. All black holes (young or old) "eat" or absorb the vacuum particles which originate a strong positive space frame curvation. Black Holes are supposed to be responsible for the Hubble redshift, for so called "Dark Matter" effects and for the Contraction of the Universe, which will collapse on itself. 12, that Cosmological time is supposed to be originated by the absorption of the vacuum by all black holes, which create Cosmological pulsating effects within long periods. For our Galaxy (about 13.000 years by Galaxy center explosions, suggested by P. LaViolette) and finally for the pulsation of the universal Big Bang- Big Crunch system, (by all black holes together) originating Cosmological Time. Conclusion: The Universe is made by evaporation of the nucleus of a Giant virgin Big Crunch Black Hole and is not expanding but contracting aiming again to a Big Crunch. Examples of Splitting and Pairing black holes etc blog.